Book Festivals are proliferating in London and the UK and all of them seem to be competing for attendees and attention, often seeking to make money. 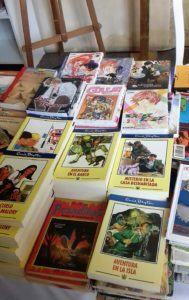 In Jerez, and many other cities and towns around Spain, Feria del Libros are local authority sponsored, subsidised and don’t have to compete – how very sensible. Plus, they are located in some amazing venues. I’m not criticising Clapham’s trusty Omnibus, but the thirteenth century Claustros de Santo Domingo would take some beating. 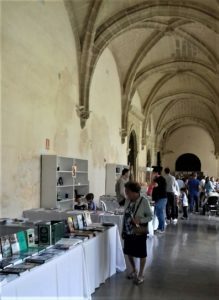 I spent a very happy few hours and more than a few Euros browsing the bookstalls and listening to a talk in the old monastery refectory on Cervantes. On Sunday morning the cloisters were full of families out for their paseo before lunch and children’s literature was well represented. I was surprised to find some Enid Blyton books, both Famous Five and Malory Towers, which clearly still have a market, even in translation. She did get the storytelling right, even if the class, race and gender prejudices which permeated the stories do not bear much examination today, or, it must be said, even when they were written. I can remember consuming these books voraciously when young, even if they were soon replaced by more sophisticated fayre. They were exciting and engaging, but soon grown out of. There is undoubtedly better available now, the range of authors writing for children and young people is huge and the quality is very high, with a Children’s Laureate and cross-over successes like Philip Pullman and J K Rowling. 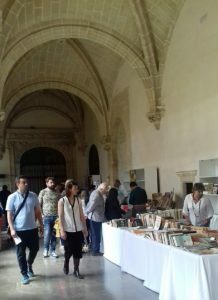 The Feria del Libros and Corpus Christi are part of the June calendar in Jerez, when the town is gearing up for Summer. Fotojenia has already begun, exhibitions of photography around the town, mostly in ancient monuments and public spaces and including projections in some of the public squares (which will usurped by coverage of the football if Spain does well in the soon to begin World Cup). Currently Arenal has a stunning display of black and white nature photography by Sebastao Salgado and there are exhibitions in the Alcazar and, when the book fair is over, the Cloisters. I’ve only got to see one so far, but it was excellent and attracted a lot of interest from Jerezanos. 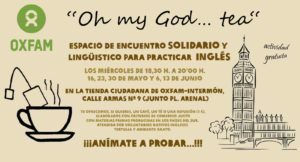 Also near Arenal on Wednesdays is ‘O my God…tea‘ a getting together of anyone who wants to practice speaking English and seeking the participation of any English-speaking residents of Jerez – my neighbour e-mailed me the details. It’s free to attend, as are the Fotojenia and Feria del Libros events, though there is fund-raising for Oxfam. The programme for the Noches de Bohemia cycle of concerts is already out, including, this year some flamenco in July. I won’t be there when it’s on so I will miss some of my favourite performers, like Santiago Lara, but it can’t be helped. There’s bad news too about the long-planned Flamenco Centre, upon which work had already begun clearing the location in the old town. It is to be shelved for lack of funds, a great shame for the city and that particular, rather run-down but charming part of it. Already a lot of the old houses there have been restored, using mainly European funds. The Bishop’s Palace is a really good example of what can be done, but there are other projects which have not progressed, like the refurbishment of the Riquelme Palace in Plaza Mercado. It’s not just grand buildings which languish unloved, there’s a small building project in my own street which has been abandoned for several years now, stopped for lack of funds and an absolute eyesore. But the sun is shining (finally) and people are out and about, despite dour economic forecasts (and a youth unemployment rate in Andalucia of over 50%). Perhaps the new government will be able to improve matters – one act of human compassion has already made people feel better. Pedro Sanchez’ government has welcomed a boatload of over three hundred African refugees, cast adrift in the Mediterranean and already driven away from Italian shores. But more on the politics later. If you enjoy reading about Jerez and its annual calendar try Summer Nights 2016 Vendimia Vendimia II Our Lady of Mercy Violet Snow The last of these is from a more innocent age. This entry was posted in Books, Culture Vulture, From a Foreign Field and tagged Books, Foreign field by juliej. Bookmark the permalink.